Amsterdam, The Netherlands – Royal Philips (NYSE:PHG, AEX: PHIA) today announced that the company is the number 3 patent applicant in the world for patents filed at the European Patent Office (EPO). With a total number of 1839 patent applications filed at the EPO in 2013, Philips has shown a strong growth of 59% compared to 2012, when it held the 12th position in the EPO’s yearly patent applicant ranking. Philips is the world’s leading patent applicant at the EPO in the categories ‘Medical technology’ and ‘Instrument measurement’ and the Philips IP portfolio reflects the company’s strategy and the businesses in which it operates. Today, more than 40% of the patent filings are in the area of Healthcare and over 30% is related to Lighting. With more than 64,000 patent rights, 93,000 design rights, 46,000 trademarks and 4,700 domain names, Philips successfully manages one of the largest and strongest IP portfolios in the world. During a press conference on the EPO’s annual results held today in Brussels, Benoît Battistelli, President of the EPO, presented the key patenting trends and statistics for 2013 as well as the rankings of top patent filing companies and countries, showing an all-time record of patents filed at the EPO. This record number proves that Europe continues to be a hub for innovation; strong patent protection and R&D investments go hand in hand and are important for the employment and growth in the EU economy. 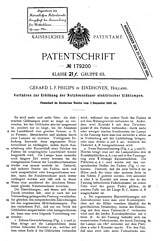 The full press release and supporting materials made by the European Patent Office can be found on www.epo.org. Royal Philips (NYSE: PHG, AEX: PHIA) is a diversified health and well-being company, focused on improving people’s lives through meaningful innovation in the areas of Healthcare, Consumer Lifestyle and Lighting. Headquartered in the Netherlands, Philips posted 2013 sales of EUR 23.3 billion and employs approximately 115,000 employees with sales and services in more than 100 countries. The company is a leader in cardiac care, acute care and home healthcare, energy efficient lighting solutions and new lighting applications, as well as male shaving and grooming and oral healthcare. News from Philips is located at www.philips.com/newscenter.